As students caught on, the engagement was super high, and the questions students asked stunned both their teacher and me. 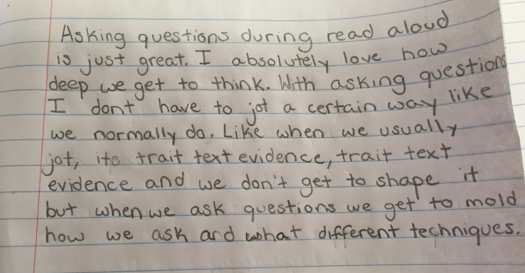 What we realized listening to them and watching them process is that for students to be able to ask the question, they probably had to be able to answer the question. That being said, some of the students brought up some sophisticated ideas. For instance, what did the whale represent to the narrator? And, what was the significance of the repetition of eye imagery? After I left, the classroom teacher asked students to reflect in their reading notebooks about how it felt to be the question askers instead of the question answerers Here’s what fourth-grade students wrote about the process. 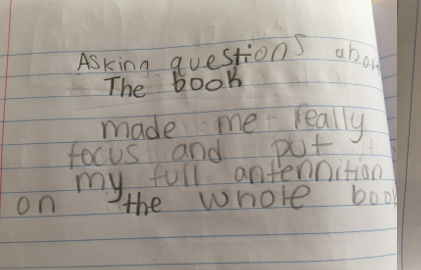 "Asking questions during read aloud helped me go farther into the book, farther than I ever have before.The questions made me think harder for an answer which made me think about the true meanings in the book. In short, it made me really understand the book." When we asked students to give a thumb up or down about whether they liked this approach, almost all of the students reported liking it. The two who didn’t fascinated me with their answers: "I just wanted to hear what happened in the book," one said. "It was hard!" the other said. "I just couldn't get the hang of asking questions." Happy reading, writing, and slicing! 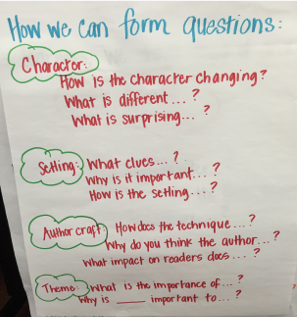 You are doing such great work in this area, Melanie - formulating these questions allows our kids to dig much deeper into the text. I got a copy of Stranded Whale and will read it aloud soon. I thought it was so sad. I wonder how my students will respond. I always ask myself how I can improve and better my teaching. They say that in order to encourage students to deepen their thinking and lead them towards where we want them to be, we have to ask them the right questions.